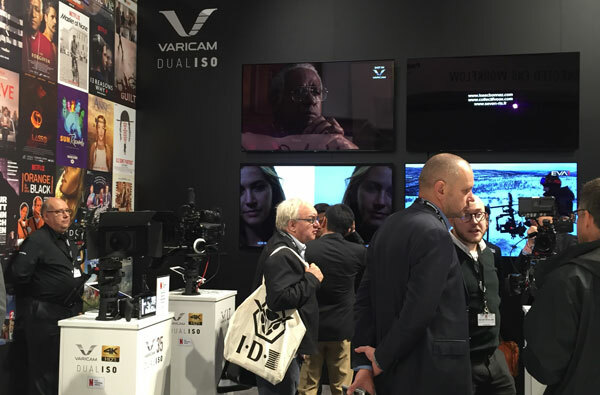 Among the novelties exhibited by Panasonic, we can highlight the interfaces to configure the well-known EVA and VariCam as studio cameras, with remote control to make it easier the creation of live content with the aesthetics typical of other productions. Thanks to the joint development with other manufacturers, different types of arms and robotic dollies are now available, both in the floor and roof versions, to facilitate the new trends and ways in the lives. As an important novelty, the new AW-UE150 camera (PTZ), offers 4K 50p and HD signal simultaneously, with a 20x lens capable of covering an angle of 75º at the angular end, inch sensor and fiber connection capacity to be integrated as a studio camera. NewTek is exhibiting new software for Tricaster, TC1 and superior models. It includes a new engine of chroma key. In addition, the company offers new versions for its Spark connectivity system, in order to enable conversions to IP NDI. RPS now encodes in H.265, improving quality in the same bandwidth thanks to codec efficiency. The new Producer, Cloud application, enables to deploy remote productions with frame accuracy, receiving signals from up to 6 sources, graphics overlay, with bonding capability, and with direct output to the main CDN networks and streaming broadcast. It has the ability to replay and slow motion over the last 60 seconds of any of the sources. Among other novelties, Clear-Com releases the V-series Iris panel, designed to provide AES67 high-quality audio without compression over IP with fully customizable displays. In addition, the company also exhibits the new FreeSpeak II base station v1.5, which provides management and diagnostics, and improved audio quality for 2.4 Ghz belt-packs. Finally, Apple Watch is incorporated into the range of devices compatible with the Agent-IC functionality. Lawo claims that audio, video and control will be closely linked in this new IP environment. Lawo is deeply involved in the development of products, such as vMatrix, with which the company wants everything to be -or can be- IP. Among 10 new products showcased this IBC, we can highlight vMatriz or VSM (Visual Studio Manager), an integral IP control system for broadcast. Screen is a subtitling company that offers technology, not service. It emphasizes its ability to make automatic subtitles speech-to-text in real time in a wide variety of languages, and with lower latency thanks to its own development technology. It has two differentiated systems, both generate subtitles in real time, some for broadcast, and others for offline, generating editable text files for later editing if there has been an overlap of voices and the content has been poorly understood. Do you want more info? Just contact us!